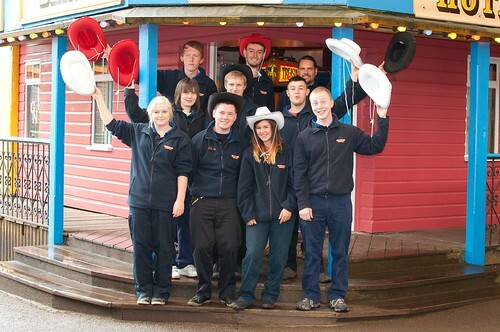 It’s a “yee-haa!” welcome at the Oakwood Theme Park in Pembrokeshire! 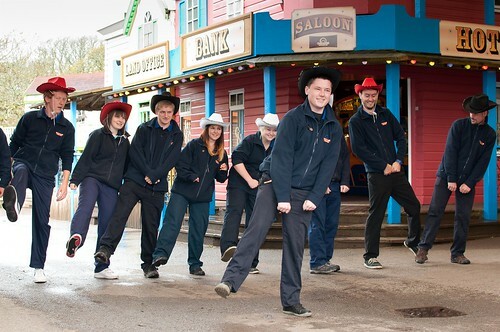 Staff at the Theme Park joined in the ‘cowboy’ theme to mark the official completion and opening of a newly themed Wild West area, complete with saloon, at the park recently. The park opened 25 years ago with a ‘cowboy’ theme, so it only seems fitting that on this momentous anniversary there should be another area with this theme. As part of the celebrations, staff donned stetsons and even took part in an impromptu line dance! Oakwood Theme Park’s Anthony Crowdie said: “We’re all delighted with the way the new-look Wild West area has turned out. It really recreates the feel of a typical frontier US town. “We decided to re-theme the area following requests from members of the public. It certainly seems to have gone down well with our visitors and we have had a number of people commenting on how good it looks. “It’s also clearly got the thumbs up from our staff who didn’t take very much persuading to dress up and take part in their own version of line dancing to celebrate its unveiling!” he added. The park is planning a series of special events and celebrations to mark the anniversary. Exciting added attractions for 2012 also include extended late-night opening in July and August with fireworks finales and the return of the hugely popular High Diving Show for the summer. To enter the competition to win free tickets to Oakwood Theme Park, just get your hands on the latest copy of Holiday Villas and Cottages Magazine! Staff practice their line dancing! This entry was posted on May 22, 2012, 7:30 pm and is filed under Advertisers, Articles, Bank Holiday, Competition, family days out, Fun, Group holidays, Holiday advice, Last minute breaks, Online Magazine, Wales. You can follow any responses to this entry through RSS 2.0. You can leave a response, or trackback from your own site.